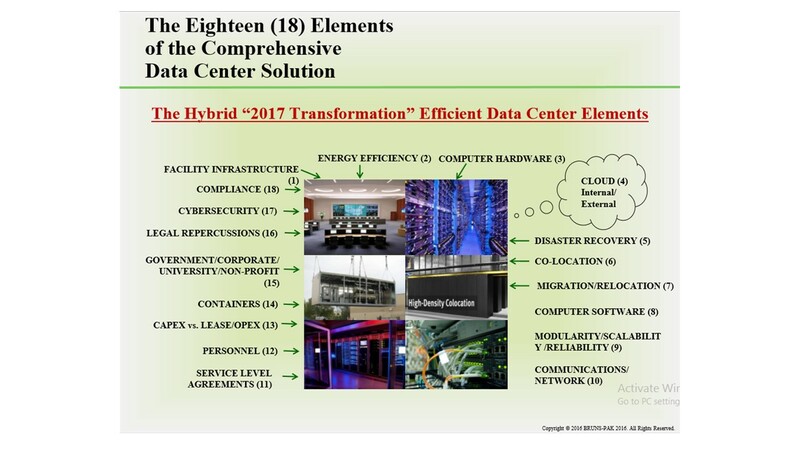 The new year brings about many articles that look over Data Center and Tech trends from 2017, in order to predict trends in 2018. We like to peruse them as it always validates that BRUNS-PAK and Principal Mark Evanko are spot on when it comes to Thought Leadership in our industry. A common element that industry articles discuss is that there will be more Gatekeeping when it comes to the cloud. More and more Companies will seek and find a balanced approach to Cloud Storage and the use of on premise Apps and Data Center configurations. There are some eggs that are better left in the basket and Mark Evanko, our CEO and Principal Engineer at BRUNS-PAK has long been sharing his presentations on key elements to consider when creating a Data Center Hybrid Solution. He lays out the map for our existing and future clients to utilize and the thought leadership keeps coming. What used to be a 16 Element Solution is now 18 Elements and posted here for you.